Attentive Nursing Care is compassionate, personalized and reliable. Our services are provided by licensed RNs, certified in Florida and familiar with the local medical community. Alzheimer’s Care: Continuity of care is essential when caring for patients with this disease. In addition to basic care, our staff will stimulate the patient cognitively which can slow the progress of disease. 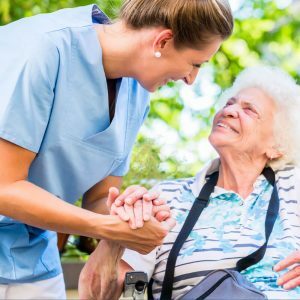 Dementia Care: Dementia may lead to loss of memory, loss of reasoning and judgment, personality and behavior changes, as well as physical decline. Once the stage of dementia is determined, a plan of care will be developed to help educate the caregivers, reduce stress levels and maintain safety in the home. Diabetes Care: Physical assessment data will be gathered for speech and oral expression, neurological, cardio-respiratory, skin, urinary tract function and emotional and behavioral status. The RN will assess and monitor dietary requirements and creates an exercise program that meets the patient’s needs. Blood sugars will be monitored and all changes reported to the physician. Exercise & Strength Training: Flexibility, strength, cardio activity and balance are the four components of exercise and each affects your muscular endurance, heart, brain and entire body. Our RN will recommend an exercise program appropriate for the patient in the safety of his own home. Injections: Our RN can administer medication and insulin injections, as well as educate the patient/caregiver on the medication, side effects and administration, if needed. Medication Management: The RN will review all medications and inform patient/caregiver the reasons for the prescribed medication, dosage, side effects and interactions. Weekly medication box filling and prescription pickup is available. Nutritional Support: “We are what we eat.” Dietary requirements and intake are reviewed and necessary modifications are made to meet the needs of the patient and the physician’s orders. Patient & Family Education: Our RN will assess the education needs of patient, caregiver and family members. A treatment plan and goals will be established and updated on an ongoing basis and reported to the physician. Cosmetic Surgery Recovery: The RN will provide transportation to/from the procedure, including overnight care in the patient’s own home if required, as well as follow through with all physician’s orders and medication administration. Post-Surgical Care: In-home monitoring of all post-op patients, including dressing changes, pain assessment, infection signs and educating patient/caregiver on the healing process. Through experience, we know that Attentive Nursing Care means ensuring the highest quality medical care combined with support for the mind and spirit of those we serve. This holistic approach allows us to tailor our services to your needs. For more information: 239.572.8616, Susanmj499@comcast.net.